THEY may be better known as the Cairngorms but they looked more like their given name, the Monadh Ruadh, as they glowed a burnished red around me. It was 4.30am and the sunrise had just cleared the top of Braeriach and was painting the entire landscape with a copper wash. The remaining snow still clinging defiantly to the faces of the massive, bitten cliffs dazzled in the piercing early light while the moon dominated the horizon to the south, refusing to say its farewells just yet. It was the perfect pay-off for putting my trust in the predictions of a perfect weather window. Mind you, that trust had been wavering during my evening drive up the A9 in sometimes monsoon conditions, and again on the flooded road from Coylumbridge. By the time I had reached the Sugar Bowl car park on the Cairn Gorm ski road around 10.30 the rain had eased. Now I just had to sit and wait for my moment. The drumming on the roof halted, the windscreen cleared. But the next problem was now evident: Midges, massing at every window, trying to storm my own private Alamo. Fifteen minutes after midnight I made a break for it. As I emerged from the dripping trees, the clouds parted and the full moon came out to greet me. The head torch was switched off as I took the path towards the Chalamain Gap, but as I made my way into this rubble-filled gully the natural light was snuffed out amid the tight contours and the torch was back on again. The rock chaos of the Gap is no place to be stumbling around sightless. By the time I was rising on the Sron na Lairige ridge, the clouds on the horizon behind me sat like skyscrapers pushing up out of the distant pink glow. Off to the far left were the twinkling orange street lights of Aviemore, a miniscule nod to civilisation in this vast landscape. Further on, an early mist engulfed me, swirling up from the Lairig Ghru and pouring over and around the dark mountain shapes. One minute they were there, the next they were gone, the ultimate magic trick. 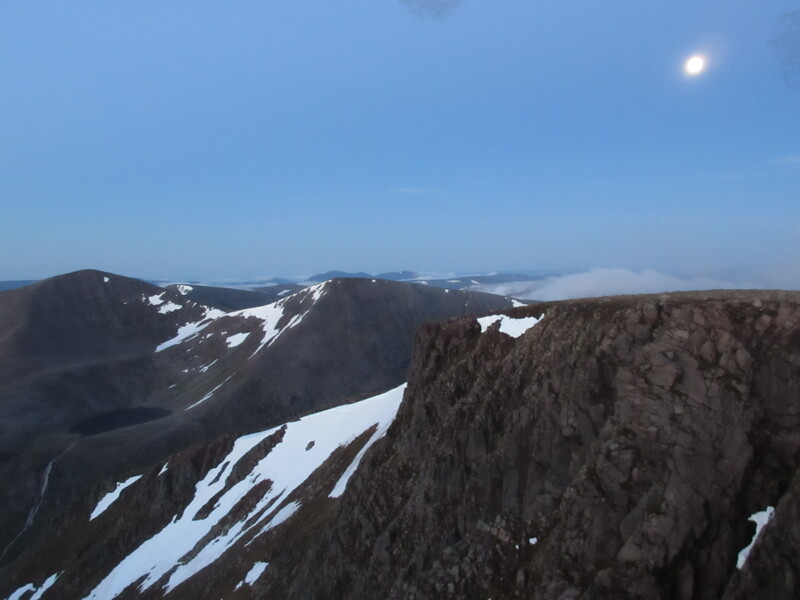 By the time I reached the start of the final climb to Braeriach, it had cleared again and the moon regained the initiative, lighting the length of the ridge, picking out every summit, every variation, every abstract image presented by the streaks of snow on the faces. 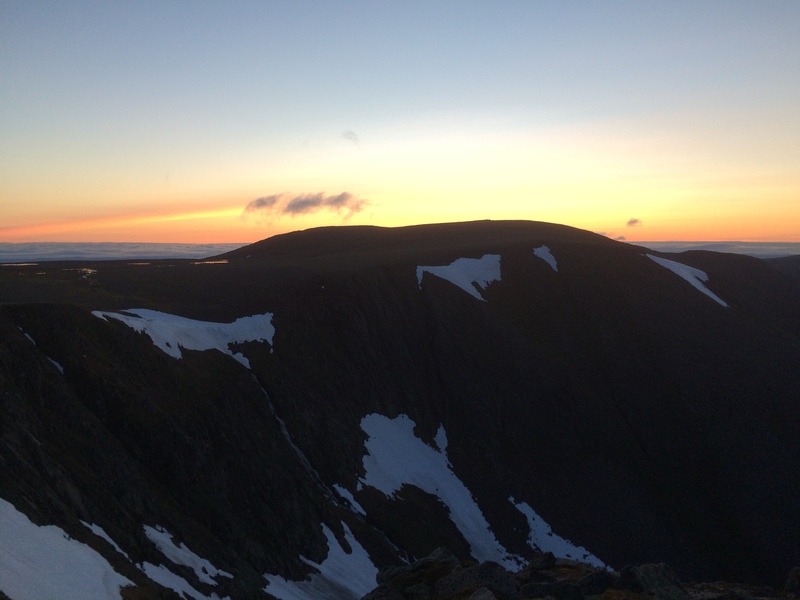 I passed round Coire Bhrochain and its plunging cliffs, hopped over the Wells of Dee and then curved round to the col above An Garbh Choire to welcome the sunrise. It didn’t disappoint. The cradled Lochain Uaine was sparkling hundreds of feet below, the view from The Angel’s Peak washed out like an over-exposure in one direction, a burning red fire in the other. 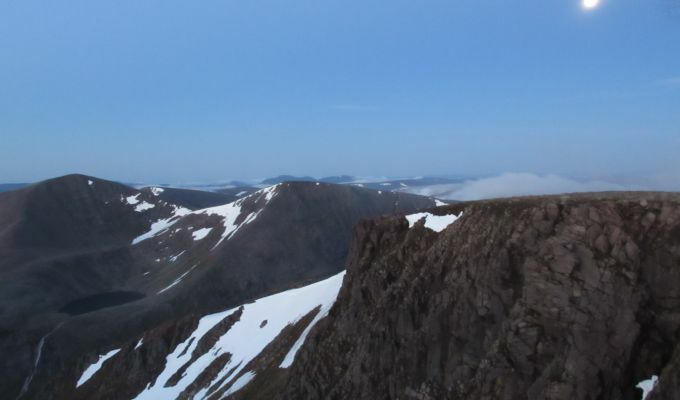 By 5.15 I was sitting in the shelter cairn on Cairn Toul having breakfast, looking over at the sunlit twin humps of Ben Macdui. I had yet to see another soul. There was sound everywhere and yet there was silence. There was light everywhere and yet there were dark shadows. This is the true beauty of the night-time walk - that and the feeling you could be the only person on the planet. But normal service would soon have to be resumed. It was chilly on top and beautiful though the views were I didn’t sit around too long. I had managed a huge walk in cool temperatures, but it was a long way back and the heat was rising. It was 8.30 before I finally met another walker. By the time I reached the Gap again the heat was becoming oppressive and the hills were alive with people. Some were already over-heated and struggling. Ten hours on a 37-kilometre trek over the mountains, eight without seeing a soul. It reminded me why I had spent so much of my walking life tackling hills this way.